We are drawn to haunted houses like a moth to a flame. We already love homes and are fascinated by their grandeur and intimate details. Add a murder mystery or a troubled fate and we're all in! Halloween has been such an exciting (and spooky!) time in the District that we decided to share the top 10 haunted houses in the United States. Grab a handful of candy and read below! The Winchester Mystery House belonged to Sarah Winchester, widow of gun magnate William Wirt Winchester. Following his death, Sarah moved out West and bought a small farmhouse to which she created this monstrous home. She believed in paranormal activity and that ghosts were following her. Over 30 years she constructed doors that didn't open, hallways that lead to nowhere, and "floating" staircases. The house is now open to the public. The Amityville house is arguably the creepiest on the list. In 1974, Ronald DeFeo Jr. shot and killed 6 members of his family and was sentenced to prison. In December of 1975, The Lutz family moves into the home. Before February, the family left the home claiming they were terrorized in the house. Their experience is the basis of the book "The Amityville Horror" and multiple movies. Home to our President and our past presidents it may be to no one's surprise that the White House is on the list. The White House has the most famous ghosts in the country! The most viewed ghost is said to be Abraham Lincoln with frequent sightings of our past president. He is said to appear under great times of duress and has a calming presence in the White House. Located in Lousiana, this home has no shortage of ghost stories. Said to be haunted by many types of ghosts, this house leaves much to the imagination. The home was originally built by General David Bradford who fled the United States to avoid imprisonment. It is said to be the location of nearly 10 deaths and is even built on an Indian Burial ground. The Joshua Ward House may be one of the few homes not named for the person who actually did the haunting, George Corwin. Sheriff George Corwin was responsible for many deaths during the Salem Witch Trials and when Corwin died, he was buried in the basement of his home. When that home was destroyed, there was a new tavern built upon it, The Joshua Ward House. He is said to haunt the home as well as a witch who he killed during the trials. The LaLaurie house is named after owner Delphine LaLaurie who was a socialite as well as a serial killer. Delphine is said to have tortured her house slaves. In 1834 when emergency responders came to her mansion they found slaves bound in the attic. She escaped to France and her whereabouts from there are undocumented. Franklin Castle is located in the Ohio City neighborhood of Cleveland, OH. Franklin Castle was home to Hans Tiedemann who became rich from the barrel-making business. Three of Tiedemann's infant children died in the home as well as his 15-year-old daughter from diabetes and wife from liver disease. He is said to have also killed his mistress for wanting to marry another man. The home has been empty for a number of years and has changed ownership many times but when plans came to fruition mysterious fires or legal trouble seem to set in.. The Whaley house is the second house on the list to be built upon haunted land. The Whaley House was built on top of an old graveyard. It was the home of Thomas Whaley and his family. The home is now a museum dedicated to its former owners and they are said to be frequently seen in the home. However, part of the home was also rented out to the County of San Diego and used as a courtroom which could be why so many other spirits are seen lurking around awaiting their fate. The Sauer Castle is located in Kansas City, Kansas and was built by Anton Sauer, an Austrian immigrant. Sauer's family owned the property for many generations but many tragedies also occurred here. There have been two suicides, one drowning, and one natural death in this home. The house fell into derelict after the descendants passed away. Visitors can frequently hear laughing, shouting, or crying. To end our Haunted Houses on a happier note we will leave you with the Pink Palace! 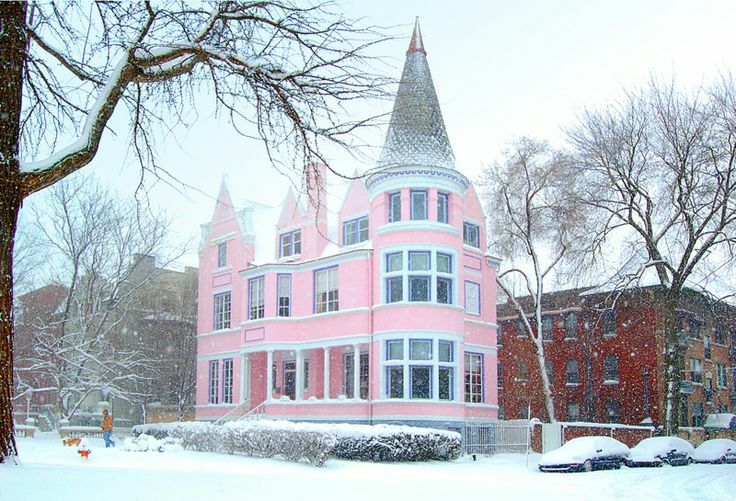 The Pink Palace was used as a gentlemen's club in the 20th century which later was converted into a private residence. There is said to be one ghost, Avery, who has appeared over the years. He is said to be a well-dressed gentleman who is a friendly spirit that keeps the tenants safe.